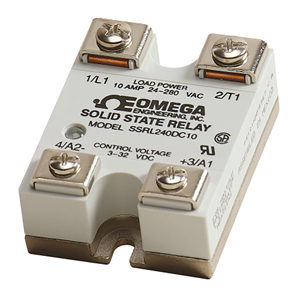 The Omega's SSRL series of solid state relays are used to control large resistance heaters in conjunction with temperature controllers. Solid state relays are SPST, normally open switching devices with no moving parts, capable of millions of cycles of operation. By applying a control signal, an SSR switches ON the ac load current, just as the moving contacts do on a mechanical contactor. Three-phase loads can be controlled using 2 or 3 SSR’s. Use 3 SSR’s for Y or star 3-phase loads using a neutral line. Two SSR’s will control “delta” loads with no neutral line. Three solid state relays are also used when there is no neutral load to provide redundancy and extra assurance of control. "Switching" takes place at the zero voltage crossover point of the alternating current cycle. Because of this, no appreciable electrical noise is generated, making SSR’s ideal for environments where there are apparatuses susceptible to RFI. These SSR’s are of the twin SCR type, inherently more reliable and capable of higher overloads before failure than triacs. Heat is developed in a solid state relay due to the nominal voltage drop across the switching device. To dissipate the heat, an SSR must be mounted on a finned heat sink or aluminum plate. An SSR should be located where the ambient temperature is relatively low, since the current switching rating is lowered as the temperature increases. Another SSR characteristic is a small leakage current across the output when the relay is open. Because of this, a voltage will always exist on the load side of the device. In comparing SSR’s with mechanical contactors, the SSR has a cycle life many times that of a comparably priced contactor. However, SSR’s are more prone to failure due to overload and improper initial wiring. Solid state relays can fail, contact closed, on overload circuits. It is essential that a properly rated, fast blowing I2T fuse be installed to protect the load circuit. Finned heat sinks are anodized fabrications that come complete with tapped mounting holes and screws. See thermal rating curves and ordering instructions for proper selection. All SSRL series relays come with a thermally conductive pad mounted on the baseplate. This will significantly improve the thermal conductivity between the heat sink and SSR baseplate. It is also suggested that 10-inch-pounds of torque be used on the SSR mounting screws. *Transients above table value should be suppressed. 注: All SSRL Series come with thermally conducting pad. Reference SSR330 Series for additional heat sinks.